The addition of a USB 3.0 port makes Intel’s Compute Stick more user-friendly, but this form factor still has a ways to go before it'll grab a wide fanbase. For $159, the Intel Compute Stick is a pretty good deal. You get a full license for Windows 10 Home and a PC that’s ready to go out of the box—just add a display, a mouse, and a keyboard to get started. And unlike Google’s stick computing product, the Asus Chromebit, you’re not restricted to just a handful of tasks in a limited environment. You can do anything that requires Windows. In theory, at least. Though Intel has announced forthcoming Skylake Core m versions of the Compute Stick, this particular model is a light refresh of its Atom-based predecessor. So while you can try most anything, the hardware largely limits you to the most basic of tasks. Still, if simplicity suits you, this product is hard to beat. What’s a Compute Stick, again? 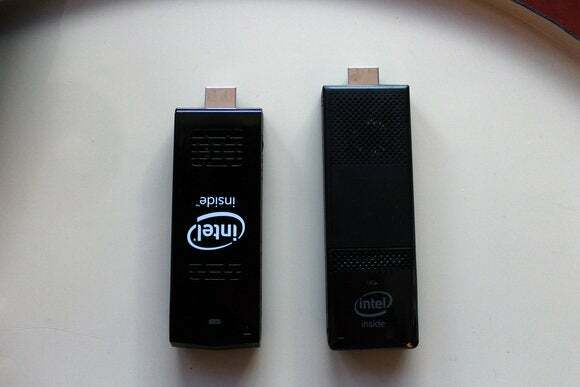 Intel’s original Compute Stick is on the left; the new Cherry Trail version is on the right. 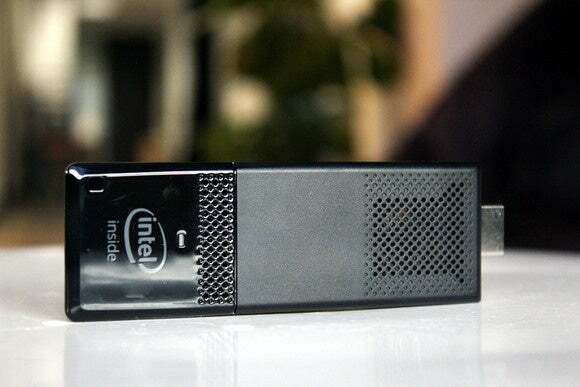 Last April, Intel launched its first Compute Stick with a Bay Trail Atom Z3735F processor, 2GB of RAM, and Windows 8.1 with Bing for $150. At 4-inches long and 1.5-inches wide, it was tiny enough to shove into a pocket. And unlike the company’s Next Unit of Computing line of miniature bare-bones computers, which require the separate purchase and installation of storage drives and RAM, the Compute Stick was a complete system like any desktop PC. It even came with an 8-inch HDMI extension cable in case it didn’t easily fit into the ports on your monitor or TV. But while a solid first effort, its lack of a second USB port and slow performance limited its use. This year’s Compute Stick continues Intel’s efforts to establish another new PC form factor, and while the tweaks in this second-generation Atom version are minor, they do improve the day-to-day experience. 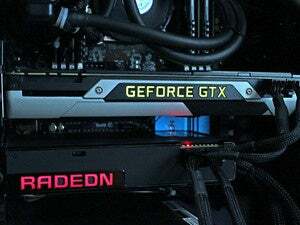 The hardware upgrades are the less noticeable changes, though they extend beyond just a processor change from last year’s Bay Trail Z3735F chip to a Cherry Trail Atom x5-Z8300 running at 1.44GHz. The combo Wi-Fi/Bluetooth wireless card is now an Intel dual-band Wireless-AC 7265 instead of last year’s Realtek RTL8723BS, which adds support for 802.11ac and Bluetooth 4.2. And the speed of the DDR3 RAM is slightly faster, running at 1,600MHz instead of last year’s 1,333MHz—the amount has been kept at 2GB, though. The refreshed Intel Compute Stick features the addition of a USB 3.0 port. The amount of eMMC storage also remains the same at 32GB, and feels as cramped as ever, if not more so. After running all the latest Windows 10 updates, about 4GB of free space was left. Wiping the previous version of Windows 10 that the OS had saved as a backup freed another 8GB, leaving almost 12GB to work with, but much of that was depleted after installing our benchmark programs. If you plan to store large files locally, you’ll need to take advantage of the microSD card slot. 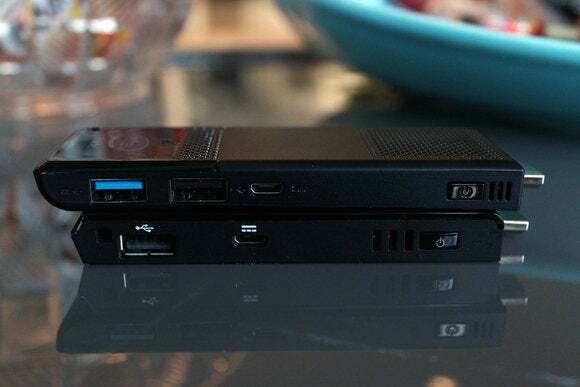 Externally, the Cherry Trail Compute Stick has gotten the much needed addition of a USB 3.0 port, which complements the microSD slot and USB 2.0 port that are carried over from last year. This upgrade alone makes this year’s Compute Stick a vast improvement over last year’s; as you’ll see below, the performance differences between the Bay Trail and Cherry Trail processors are so small you won’t feel them much. 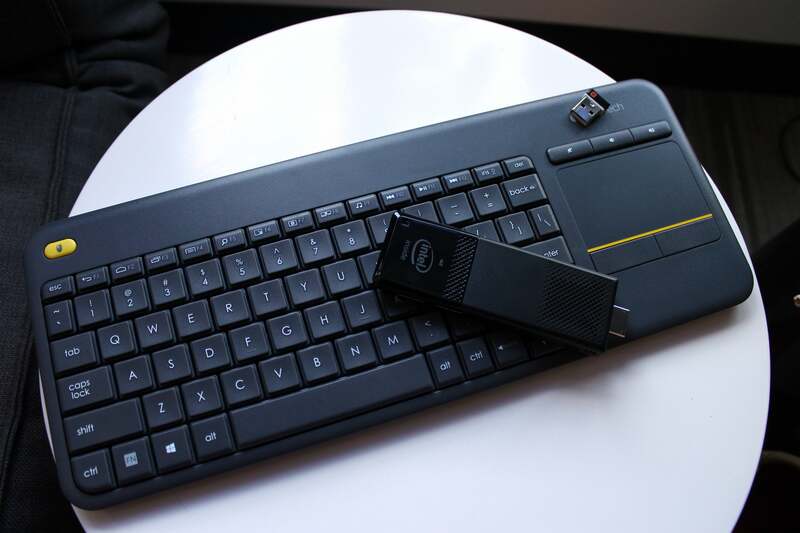 Initial setup for the first Intel Compute Stick required the use of a USB hub or combo keyboard/mouse. The 2016 version (pictured here) can support two wired peripherals for setup. But not having to hunt for a combo wireless keyboard/mouse (like a K400 plus) or a USB hub for initial setup? Priceless. Even having two ports open after switching to Bluetooth peripherals makes everyday use dramatically better. One can be available for an external hard drive while the other remains free for quick access to files on a USB thumb drive. A USB hub becomes optional, which means one less thing to bring along if you take the Compute Stick on the road. On the software side of things, Windows 8.1 with Bing has been tossed in favor of 32-bit Windows 10 Home. There’s no official Linux variant this year, but you can buy a $145 version of this new Compute Stick without an OS. If you had high hopes for notable gains with the changeover to Cherry Trail, stuff them back down. With the exception of graphics performance, the x5-Z8300 shows only minimal gains over the first-generation Compute Stick’s Z3735F. It even showed a slight dip in our PCMark 8 Work Conventional score. But even the leap in graphics performance from Bay Trail to Cherry Trail isn’t much. While it’s impressive in terms of percentages—the gains are 57.6 percent and 63.8 percent for 3DMark’s Sky Dive and Cloud Gate benchmarks, respectively—the scores are well below those of more powerful processors. Anything beyond basic flash games is still off the table. Really, you won’t be doing much more than basic home or office tasks on this computer: document creation and editing, web browsing, email, watching videos, and light photo editing. So the small differences in these benchmarks don’t tell much of the actual story. On the whole, both Compute Sticks are best suited for doing just one thing at a time. When using the Bay Trail stick, you’ll notice a bit of delay when switching between different tasks; when using the Cherry Trail stick, programs and tabs open faster, but the loading time for the content lags before the windows fill out. As for storage performance, Intel says that the eMMC drive in this new Compute Stick is supposed to be faster, but that didn’t bear out during testing and spending time with the system. In any case, you won’t be moving much on and off this stick, given the low amount of storage available. It’s better to load music, movies, and other files you want to regularly access on a microSD card (or several), or stream the content. So has the need for palm-sized PCs grown since the first Compute Stick launched last April? It doesn’t seem so. Businesses might appreciate a cheap, simple Windows 10 device that can tuck out of sight when creating displays for stores and trade shows, but outside of a handful of specific use cases, most home users don’t need such a small desktop-style computer. You’re still more likely to bring a laptop or a Chromebook with you on the road, since not every destination will have a spare monitor. And speaking as someone who does fall into the niche group of users who desire a more powerful but still portable version of a streaming device, it’s still a toss-up for me between the Compute Stick and the Chromebit for traveling. The Chromebit also supports Flash (and thus most of the niche streaming sites I’d access while holed up in a hotel room), has better support for Bluetooth peripherals out of the box, and costs half of what the Intel Compute Stick does. 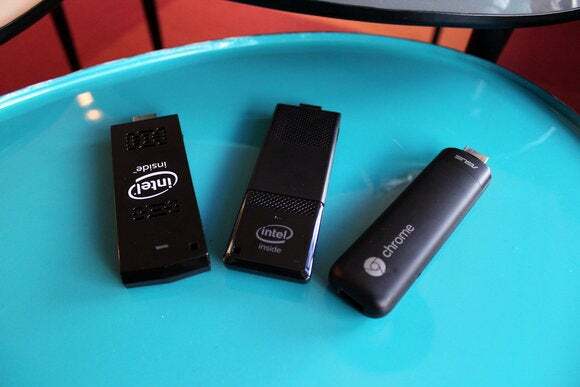 Two generations of Intel Compute Stick hanging out with Asus’s Chromebit. But as a cheap and simple PC, the Intel Compute Stick’s hard to argue with. While on the slower end of computing, it still handles the usual, everyday tasks that a more expensive mobile device can't muster. You get full-featured browsers, plugin support, and can stream 1080p video from any source. It’s great as a sophisticated streaming device for a TV, since you get the full power of Windows 10 while paying just $40 more than it’d cost for an equivalent standalone Windows license. It’s also a solid option if you don’t want to spend a lot on a machine, don’t have a lot of demanding tasks to do, and can be patient with slower load times. It’s possible that the coming Skylake Core m3 and Core m5 versions will make this form factor more appealing, even despite the jumps in price. For power users, the Core m3-6Y30 version might hit a sweet spot at $399 with the inclusion of a Windows 10 license, whereas businesses may get more out of the Core m5-6Y57 vPro model, which will go for $499 without any installed OS. We’ll know how it shakes out very soon, as Intel said at last month’s CES that it plans to release these models in February.